Lording it over the rest of the city, drink in hand, is truly one of life's great pleasures. Melbourne may not have the greatest weather, but when the temperature rises and the sky is clear, it always delivers on the outdoor drinking front. While we're talking beverages at these Melbourne rooftop bars, we've also scanned the city for the best cocktail bars, wine bars and laneway bars. Cheers! Undeniably the most exciting part of the QT Melbourne development has to be the huge new indoor-outdoor split rooftop bar, appropriately named 'The Rooftop'. It’s a sleek, elegant new addition to Melbourne’s bar scene that has a reputation for milk crates and astro-turf. You’ll want to knock back some serious sunset cocktails in some vintage threads to match the understated mid-century vibes of the deck. Brought to you by the folks behind Fancy Hank's, Good Heavens is serving cocktails and casual bar food all summer: think cheeseburgers, spicy Southern fried chicken, and chilli nachos with brisket mole from Fancy Hanks’ giant smoker downstairs. The cocktails, while made with primo ingredients, are inspired by the 80s, before nitro taps were a thing and drinks in 50 shades of neon were de rigeur. This is the place to be on balmy summer nights when you want to feel like you’re in Palm Springs. 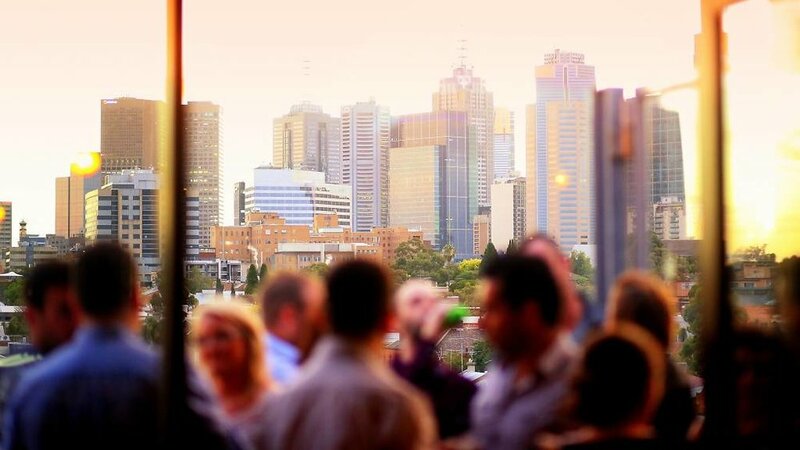 Once you ascend the seemingly endless flight of stairs to the Rooftop Bar (passing Cookie and the Toff in Town along the way), catch your breath and quench your thirst while taking in the heart and soul of Melbourne from above. Kick back on the fake grass, or huddle under the heating and lose yourself in the spectacular view. One of Richmond’s best rooftops has reopened in time for summer gigs, cold pints and pub meals in the sun. The renovated Corner Hotel rooftop is serving the pub’s new menu that now feature share dishes, pub classics, and a late-night bar food menu, if you don’t feel like a kebab for your post-gig bite. Big ups to Therefore Studio for making the rooftop wheelchair accessible and for adding more seating area for those long summer nights. The Rivoli is paying homage to cinema's golden age with nineteenforty, a rooftop bar set on top of the heritage-listed Art Deco cinema. The rooftop bar will be accompanied with a garden fit out, offering panoramic view of Camberwell and Hawthorn which means you don't have to be seeing a movie to visit the Rivoli. nineteenforty will be perfect for summer drinking – the old-world cocktail menu is dotted by classics that will make for as delicious pre or post-film beverage. There's also a bar snacks menu for a rooftop snack. Enjoy the sunshine at Fonda's rooftop bar at the Mexican eatery's Windsor hold-out. Kitted out with bright umbrellas, garden plants, and Fonda's signature bright furnishings, the general vibe here is like that of a great backyard. The rooftop bar will be open all year around, which means you can enjoy a fresh breeze and natural light with Fonda's tacos and aguas frescas cocktails. The rooftop at Marquis of Lorne is arguably the best part of this grand old Fitzroy pub. The bathtub with tinnies make it feel like you're at a house party every time, and the burgers and steaks from the dining room downstairs go down a treat in the sunny spot by the Carlton sign. Even if you're not a local, the neighbourly vibe will leave you feeling like you're one. Don't hold us to it, but we think beers are better when consumed in a Hitachi train plonked on top of a Collingwood office block. 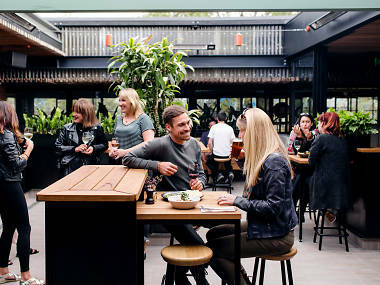 Easey's is best known for insane burgers and fried snacks that'll make your arteries threaten to give way, but there's a decent craft brew line-up on tap and the sweeping views of Collingwood isn't so bad either. Just come early to score a seat on the trains. From the multitasking marvel of Curtin House to the trippy wonderland that is the Carlton Club, Melburnians love their multi-level drinking dens. At 127 Brunswick Street, Fitzroy, with Ichi Ni Nana on street level, Village People Hawker Hall in the middle, and Japanese-inspired Upside Rooftop Bar acting as the boozy icing on the cake. Order Village People Thai-style street food from below and lord over Fitzroy, cocktail in hand. There's a reason the queues snake down Meyer Place for Loop Roof. The breezy terrace above Loop Project Space & Bar promises sparkling city vistas, primary-bright lawn furniture, AstroTurf and lush garden beds. Calling it a city oasis isn't selling it too strongly. If knockoff drinks all-too-easily edge towards midnight, fortify yourself with inventive share plates and bar snacks. Naked in the Sky is the restaurant and rooftop bar crowning Naked for Satan – Fitzroy’s bright and brassy house of flavoured vodkas and cheap pintxos (small snacks on bread – drinking fodder of Basque country, Spain). At high altitude, the bar snacks get more refined; think fried cheese and walnut croquettes, confit duck sliders and baked camembert. Imperial Hotel happens to be the third oldest pub in Melbourne, so you'll be enjoying the rooftop beer garden on a piece of Melbourne history. Your pint at the top of Bourke Street will come with 360-degree views of the Melbourne skyline and Parliament House. This is a sports-mad venue, which stays open late for all the matches and keeps it classy, clean and comfortable with a traditional English pub vibe, so wear your colours if you want to. This kitsch, cutesy rooftop promises a raucous garden party in the heart of the city. This sky-high hub has long been a favourite for summer sessions that kick off in the afternoon and end after midnight. The tongue-in-cheek drinks list doesn't skimp on the double entendre, with plenty of mention of jugs, balls and oral pleasure. Yep. The Madame seems intent on making you blush, but chances are that rosy glow will be thanks to the sunshine and booze-sloshed cocktails. South Yarra’s got a multi-level fun emporium in this joint. The lower decks are all about live entertainment and DJs, but we’ve got our eyes set on sunset cocktails on the roof. 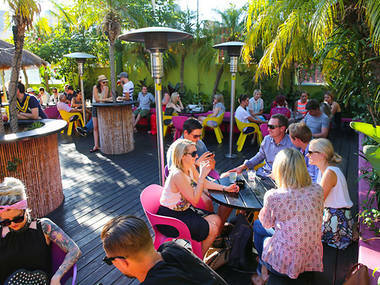 It’s replete with cushion-lined deck and daybeds, the beats are chilled and the eats are snacks or a la carte. The ultimate late-night bar, perched above Melbourne Supper Club, is a rooftop haven of frosty beers, Americanos and refined bar snacks. Solid systems, a good-time vibe and a businesslike attitude. Access this Astroturfed terrace from a stairwell in the alley behind Section 8. The perches line the perimeter so you feel like you’re drinking in an infinity pool. Drinks-wise, you can expect craft beer, pre-mixed cocktails for dispensing from siphons, and Rositas on tap. Hungry? Go for tender strips of herby fried chicken. Decadence was clearly a watchword for whoever designed the fit-out of the Carlton Club, with taxidermied exotic animals and velvet trim running rampant. Head up a floor to Palmz Rootop Bar for a taste of the tropics – not least from the cocktail jugs.